VOGONS • View topic - What are your favorite Windows 3.1 games? Windows 3.1 was/is not an ideal OS for games, but 3.x games are one of the many reasons I own a 486. Does anyone else here have a love for 3.x games as well? What are your favorites? There are may games I wish to play, such as The Even More Incredible Machine, that I haven't played yet because either I haven't got myself up to install them, or I can't because they require CD-ROM. Seeing as I'm getting a NIC soon, that shouldn't be a problem anymore. Re: What are your favorite Windows 3.1 games? There is also a version of Myst for Win 3.1 (uses a 16 bit executable instead of 32 bit), but I have never actually played it. I remember playing a 3.1 game where you had to guide a paper plane through a house. I'm sure I tried others, but none of them really held my interest. I even remember wondering: if this Windows thing is supposed to be the future, why do its games seem so simple and boring compared to DOS games? That was all during the early days of Windows though. I'm not sure if 3.1 gaming ever got more exciting, as I didn't pay much attention to Windows games until Win98 and DirectX came along. Suddenly, DOS games seemed old fashioned. Some vendors released parallel packages where you got both Win 3.1 and Win 95 versions on the same disk. I recall Sierra/Impression Games' Civil War Generals II: Grant, Lee, Sherman was such a game. Game AI and single player were poor, but it had and still has a good reputation in the multiplayer community. 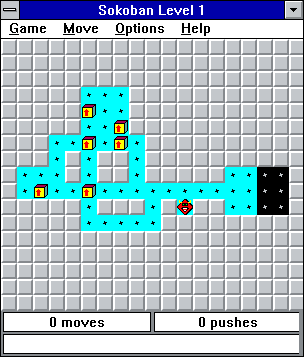 Standard Def Steve wrote: I even remember wondering: if this Windows thing is supposed to be the future, why do its games seem so simple and boring compared to DOS games? DOS games were more standard and had way more time to mature. I think it took until 95 for Microsoft to fully realize that people also want Windows for games, not just office work. As simple, boring and potentially stupid as they are, holy crap are they hooking! Apart from these, I really liked a Risk clone that I used to play with my friends... I don't remember much from it, except that it allowed up to 6 players and could chose from six maps (one was "traditional" risk, other had the shape of a turtle). Does anybody remember the name or some useful data to get it? Also, not a game, but can be classified as a toy... the sound driver for PC Speaker. It hardly can be useful (because windows stopped every time it had to sound), but we used it to get some fun in school computers. Operation: Inner Space is my favorite and while you can still play it in later 32bit Windows versions, the Joystick controls only worked (correctly) in Windows 3.x and Windows 9x. I have a epically long running game of CIV II on Windows 3.11, I highly recommend it if you enjoy that kind of turn based game. It being a CD-ROM release means you get some nice music and some cheesy FMVs. Woodruff and the Schnibble of Azimuth. I liked the wacky Gobliiins games, and this is another game from that universe. I was impressed that it ran on Windows 3.1 back in the day. I think a few other Sierra adventures were also available for Windows 3.x. There was a small window before Windows 95 was released where there were some games for Windows 3.1, maybe with Win32s support and/or WinG (iirc). Talking of custom ships though, are there sites that still host any? Standard Def Steve wrote: I remember playing a 3.1 game where you had to guide a paper plane through a house. I think you mean Glider 4.0. That was a good one. I liked Operation: Inner Space. And probably the best Win 3.1 game: Civilization II. It's amazing how they decide to make it a Windows game - no big AAA games were really Windows exclusives that I recall before that.